Thermo Electron’s DFS high-resolution gas chromatography/mass spectrometry system performs confirmation analyses of dioxins and furans in the low femtogram range. The system helps governmental, industrial, and commercial laboratories comply with the new U.S. EPA and EU directives, which call for lower detection limits for dioxins and furans in food, environmental, and biological samples. 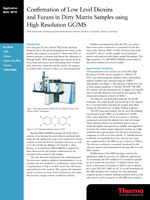 It enables rapid sample preparation and higher sample throughput. Multiple-ion detection allows scan-to-scan monitoring with precision.